Funny story about this recipe. Besides being epically delicious, it’s missing one main component of a nicoise salad: a boiled egg. ARGH! After I photographed this dish for the post, I realized I had forgotten to top the salad with the boiled egg. Once I realized it, I had already tucked it neatly away in the refrigerator in a glass container for leftovers. 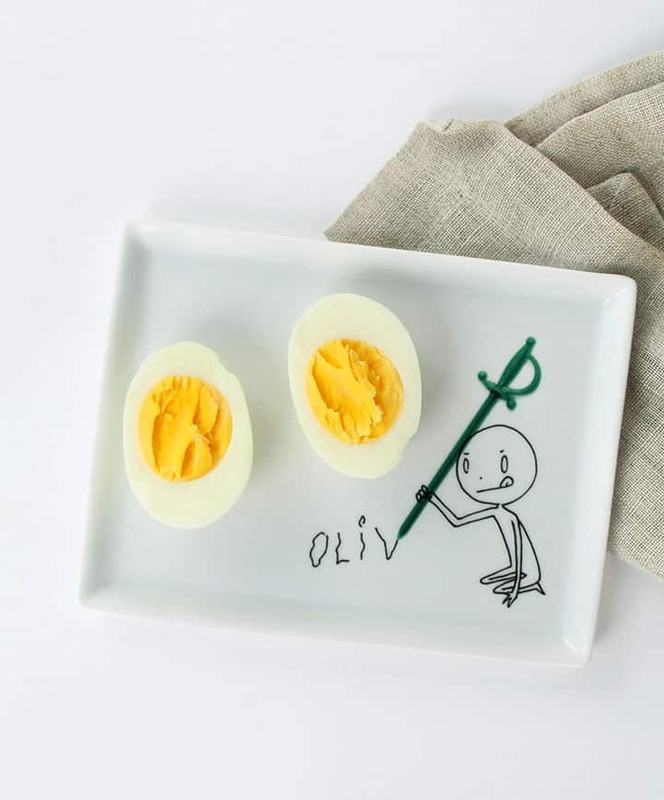 So, today’s recipe is written with a hard boiled egg, BUT, there’s no egg in the pictures. You’ve got a good imagination, right? Ha! The silver lining? I have leftover boiled eggs for snacks this week! Boiled eggs are really versatile – you can throw them with some dijon mustard and Greek yogurt and make a quick egg salad. Or, you can mix chopped boiled eggs in a bowl with a little avocado, a drizzle of lime juice and some salt and pepper and enjoy it smeared over toast. But today’s recipe isn’t about this missing boiled egg – it’s about eating creatively, yet healthily. 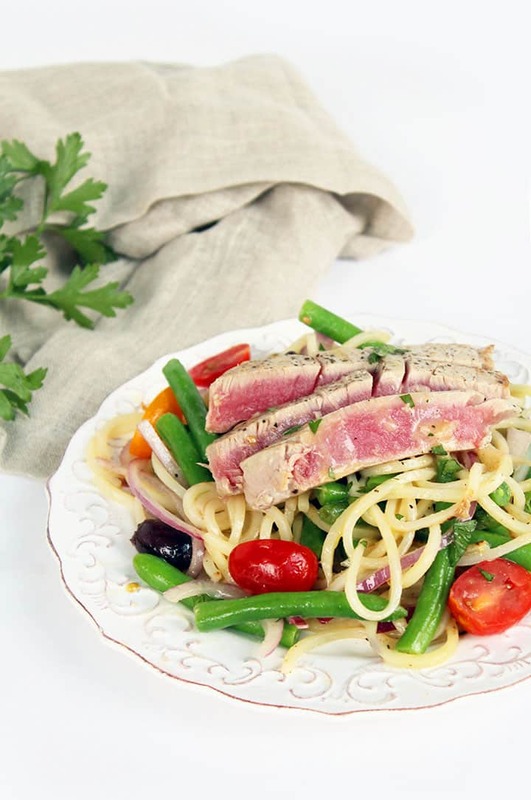 I’ve always loved tuna nicoise salads – they just have so much to them – tuna, egg, green beans, salad, potatoes, olives. They’re really one of those “I’m in the mood for every flavor possible” dishes. And I’m always in that mood! Spiralizing the potatoes helps add extra flavor – I simply seasoned them with salt, pepper and garlic powder, but you could add any spices to the potatoes (like chili powder) to give them an extra oomph. When you eat the potatoes as noodles, you eat them slower and not as much (a spiralized potato yields a lot more noodles than a cubed potato yields cubes, if that makes sense.) Plus, you’re eating a noodle salad, not a chopped salad, which, is WAY cooler. 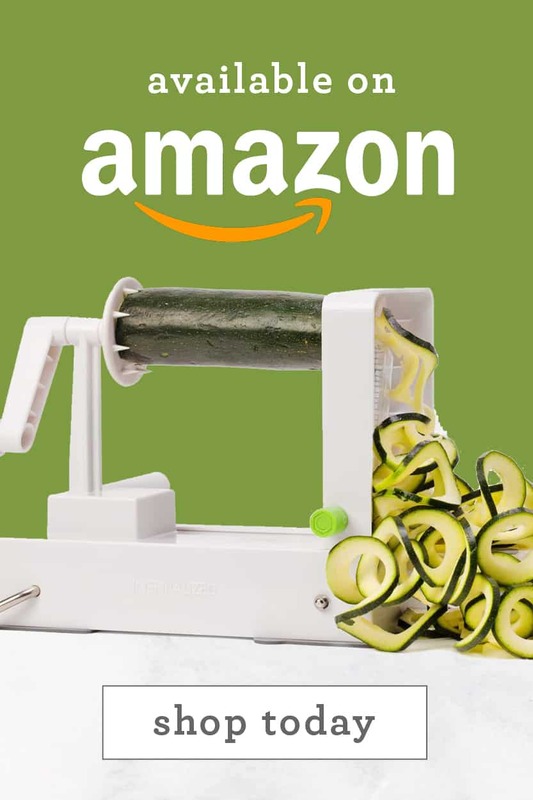 Can you tell I like spiralizing yet? 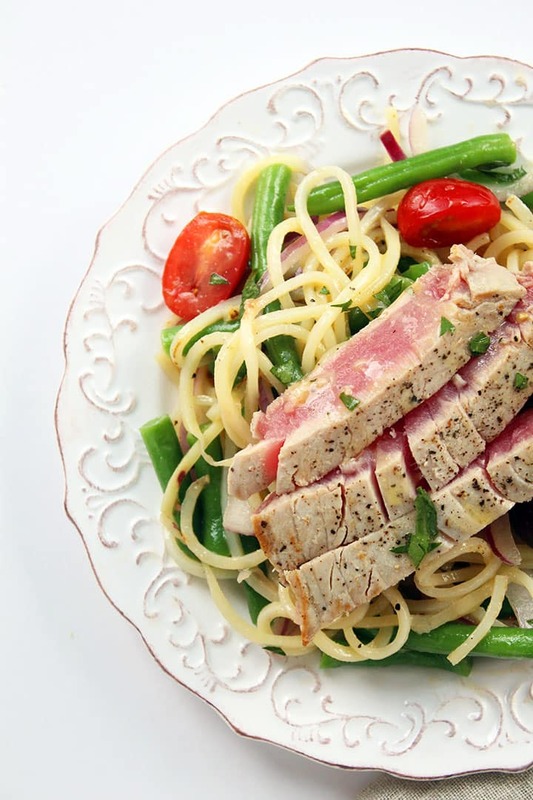 This tuna is shown as lightly seared, but if you’re not a fan of the rare stuff, just sear it an extra 2 minutes on each side to get a well-done tuna. 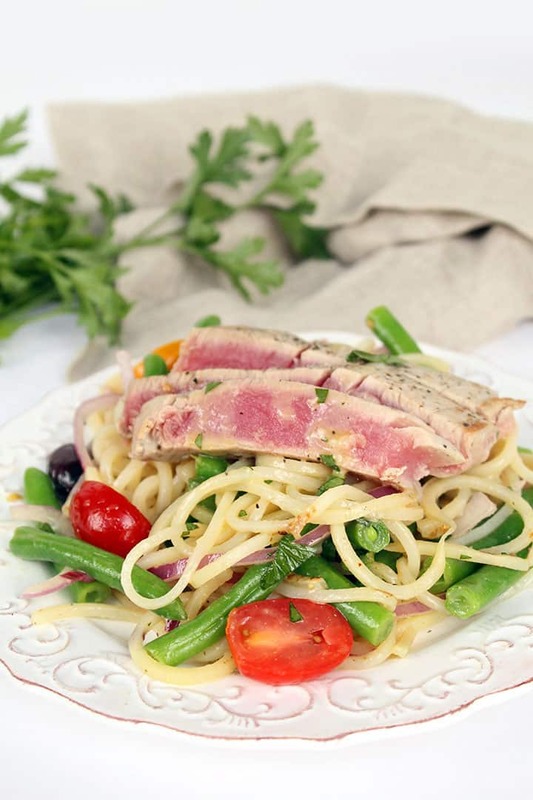 If you don’t have access to fresh tuna at your local market, substitute in canned tuna instead – it does the trick. Plus, this salad originated in Nice, France and if you don’t know already, I’m obsessed with everything French. I took French for almost 10 years and I even went to Montreal for French immersion camp when I was younger. Nerd alert! Bring a medium pot filled halfway with water to a boil. Once boiling, add in the green beans and cook for 5 minutes or until tender. 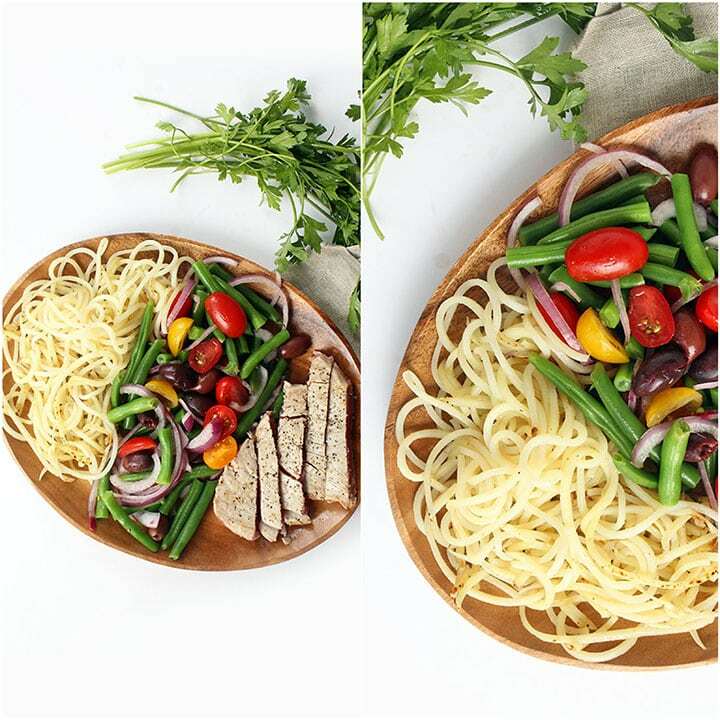 Drain into a colander and place in a large mixing bowl along with the tomatoes, olives, and onions. Set aside. Meanwhile, place the eggs in a medium saucepan and cover with water and a pinch of salt. Cover and bring to a roaring boil. Once boiling, turn off the heat and let stand for 12-14 minutes to hard boil. When done, rinse under cold water until able to be handled. Peel the eggs and halve. Set aside. While eggs and green beans cook, whisk all ingredients for the vinaigrette together and set aside. In a large skillet, place in the olive oil. Once oil heats, add in the potato noodles, season with salt, pepper and garlic powder. Cover and cook for 5-7 minutes or until cooked all the way through, uncovering occasionally to toss. Once potatoes are cooked, add to the bowl with the green beans and veggies and pour in the vinaigrette. Set aside. Season both sides of the tuna steak with salt and pepper, pressing the pepper into the tuna. Pour the lemon juice over the tuna. Wipe down the large skillet and place it back over medium heat. Once heated, add in the seasoned tuna and sear for 1-2 minutes, flip over and sear another 1-2 minutes. 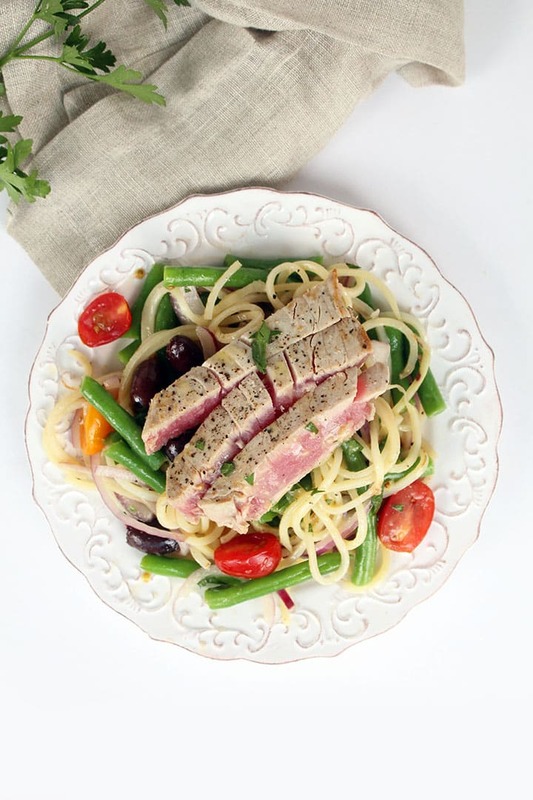 If you prefer your tuna well done and not rare, cook for 3-4 minutes per side or until done to your preference. Divide the potato noodle mixture into bowls and top each bowl with 1/3 of the tuna and 1 hard boiled egg. Garnish with freshly cracked black pepper and enjoy immediately. 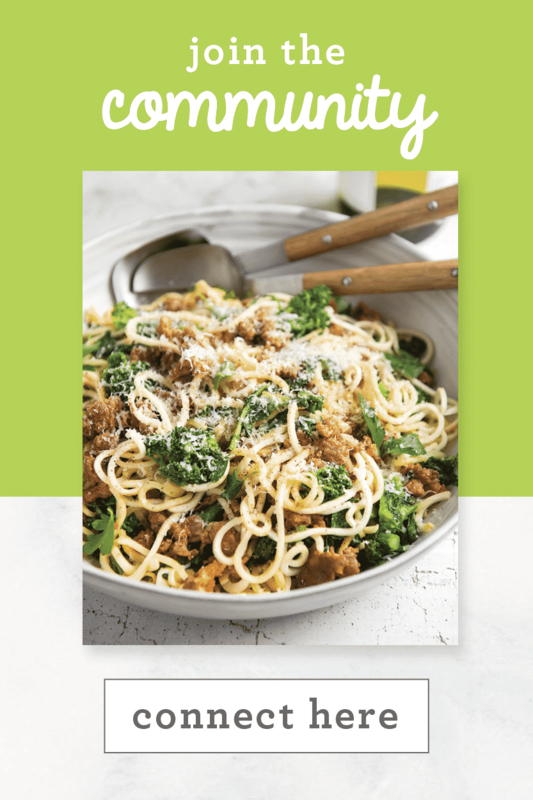 I've been a follower of the SkinnyTaste blog for a long time and love her recipes! Would love to have the cookbook! I want to win this book to make healthy meals. Can't wait to try this recipe. I will see if different types of potatoes offer similar results. Salad looks wonderful and the book looks like it would provide days of recipes! This salad looks incredible. And I would love the cookbook! 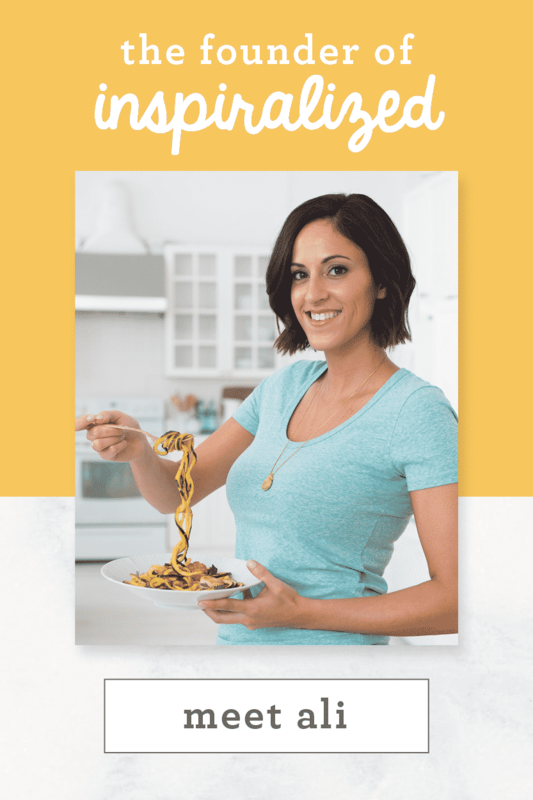 I love her recipes and would love the book! I just signed up for Skinnytaste. 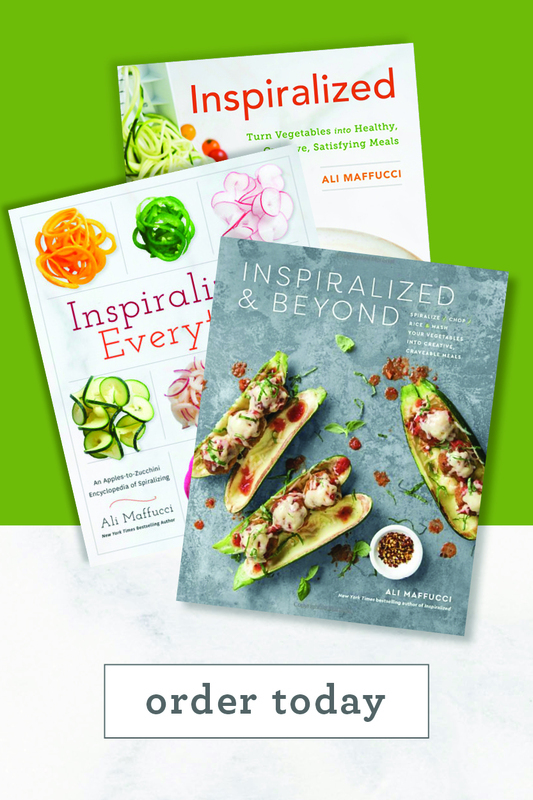 If it's as good a blog as yours, I'm going to be really busy cooking (if I win a cookbook; if not, I'll have to buy it) and spiralizing! YESTERDAY'S comment didn't go through, so here it is! ASIAN PEANUT ZUCCHINI...I think this recipe would be great with tofu, and with a little tweaking, it could be gluten-free, as well. I have a friend with Celiac disease, so I'm always looking for a great way to treat her to a "safe" meal. And to all of you who write nasty notes (but would never say the same thing face-to-face), "If you can't say anything nice, don't say anything at all." My grandmother was a schoolmarm in a one-room school and a terrific cook, baker, preserver, and grandmother; this was her motto. What a legacy to live up to! 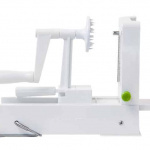 I'm behind on my spiralizing recipes and have to go shopping for tuna. I think my hubby would eat this recipe with gusto! 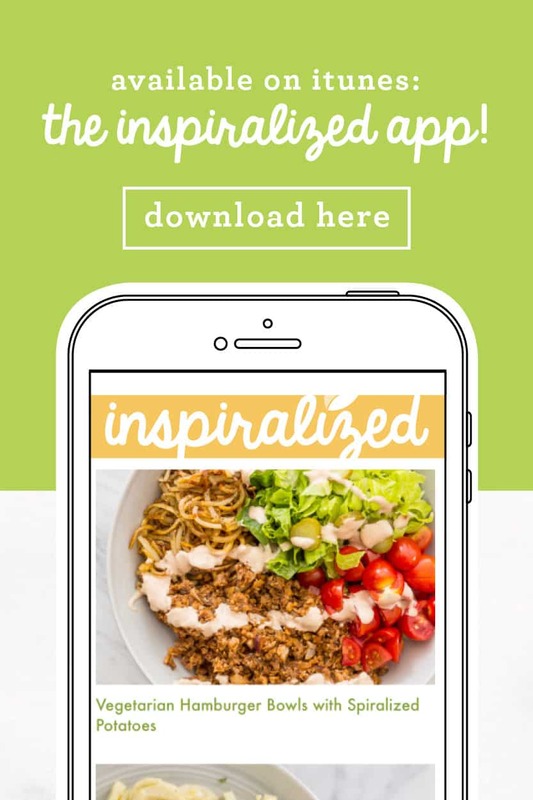 I have been following SKinnytaste on Pinterest for a long time! I have enjoyed her posts, so I can only imagine how great the book will be. WTG ~Gina ! 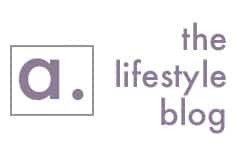 I recently discovered the Skinnytaste blog and I am hooked! I've tried many recipes, and would love to receive the book. Love the recipes....would love to own the book! Yummm! I love Nicoise Salad! 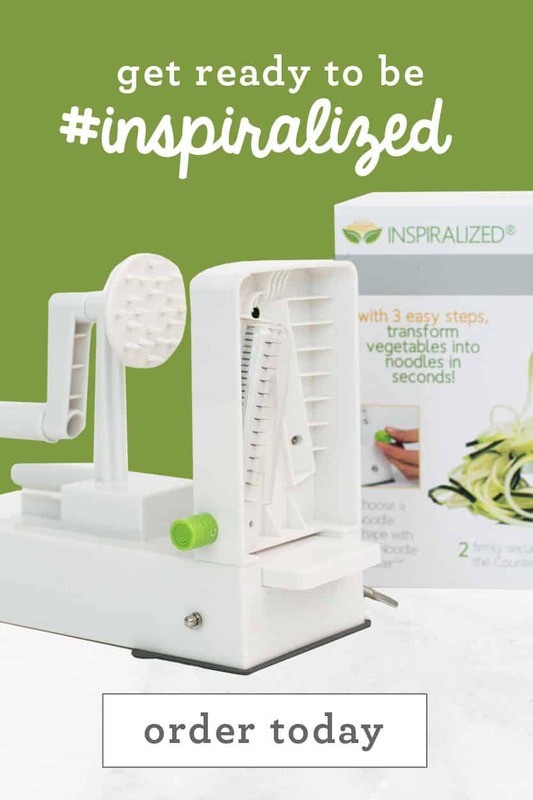 Definitely have to try the Inspiralized version! This Nicoise Salad looks wonderful, but question for you? I am doing the "low carb-thing" at this time, so what might you suggest I substitute for the potato in this recipe? Zucchini is obvious, or even Butternut Squash, but do you have any other suggestions? Thanks!